Clogged and backed up drains in your home is frustrating and can lead to flooding and costly repairs. 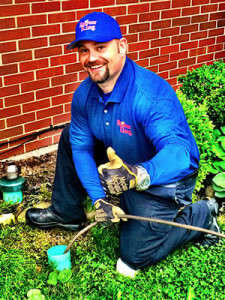 Our experts will get your water flowing the way it should in no time! We have the equipment to tackle even the toughest of clogged sewer drains. With our cameras and advanced drain clearing machines, we’re your best shot at getting the job done right the first time. We get the big jobs done! Whether you need your underground lines installed, repaired, or replaced, we got you covered. We offer on-site free estimates, so give us a call today! French drains are vital to keeping water OUT of where it doesn’t belong. A lack of, or improper french drain can lead to major costly repairs. We handle all aspects of French drains big or small. Hello and thanks for visiting Rooter King. Rooter King is the fastest growing locally owned and operated sewer and drain cleaning company based out of Greensburg, PA. We Serve Allegheny, Beaver, Butler, Fayette, Washington, and Westmoreland counties. 24 hour service at no additional cost! Having any drain in your house can be a real nightmare and cause expensive damage. Let our experts do the job right. Call us first! We may be able to save you 1000’s by using our advanced technology to try and clear the line of unwanted roots and debris, without incurring excessive excavation costs. There is no job to large! We will bring our heavy equipment and install your sewer lines where you need them. We do it right the first time and guarantee the results. If storm water is going where you don’t want it to, have our team install a French drain. They can save you 1000’s in damage by keeping water away from areas that shouldn’t be wet! We specialize in unclogging drains and major sewer line repairs, but there is no job too small. We’ll take care of it all so you have piece in mind that the job’s done right the first time! Experts in sewer line repairs and replacement.